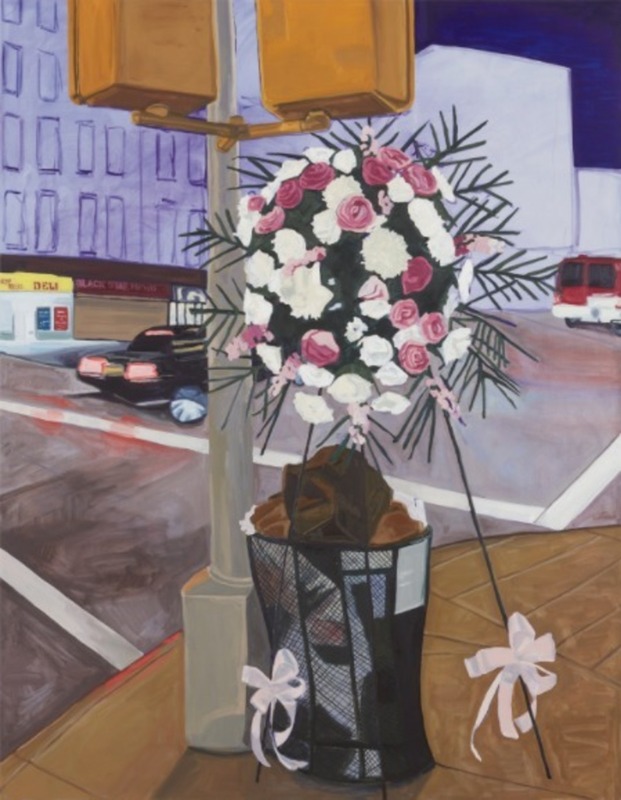 Jordan Casteel, Memorial, 2017, oil on canvas, 72 x 56". In 2015, while in residence at the Studio Museum in Harlem, Jordan Casteel took to the streets with her camera and iPhone, photographing men she encountered. Adopting this process for the exhibition of paintings here, the artist presents herself as a flaneuse, capturing the vibrant life of the neighborhood, at night, without categorizing it for easy consumption. In these portraits, men appear alone or in groups of two or three, sitting in subway cars, on stoops, and standing in front of store windows. (Women are absent, save for images on a braiding salon’s awning.) Nonetheless, Casteel’s subjects are perfectly at home in their environments, often bathed in the fluorescence of street lamps, as in Q (all works 2017), where the eponymous subject gazes back, phone in hand, a Coogi-clad Biggie Smalls on his red sweatshirt. Casteel’s paintings capture Harlem’s denizens beautifully, a community that has long shaped black American identity despite years of white gentrification. Casteel navigates her terrain with ease, lightness, and empathy.